The last game of the season brought out at least 1000 Red Fox and Sea Hawks fans to the Kelleytown stadium on a chilly Thursday night to see the defining moment for the undefeated Hartsville Red Foxes. There were some exciting moments in this game beginning with first quarter when Hartsville recovered a fumble on the Myrtle Beach’s 6th yard line. #4 RB Lacy Josey took advantage of the position and rushed in with a six yard touchdown for the Red Foxes. #1 JD Pendergrass made the PAT good bringing the score to Hartsville 7, Myrtle Beach 0. With five minutes left in the first quarter, Hartsville was awarded a safety. The score was now Red Foxes 9, Sea Hawks 0. The Foxes had first down on their own 42 yard line. One minute later the ball was on the Sea Hawks 27 yard line. #15 QB Tiyon Evans took the ball across the end zone for a Red Fox touchdown taking the score to Foxes 16, Sea Hawks 0 after the good PAT. Hartsville kicked off to Myrtle Beach. Myrtle Beach had the ball on their own 39-yard line. Hartsville pulled off a crowd-pleasing interception on their own 22 yard line. With under a minute on the clock, #1 ATH JD Pendergrass recovered a fumble on the Sea Hawks’ 31 yard line at the end of the first quarter. In spite of all the yellow flags and penalties midway of the second quarter the Foxes completed another rushing touchdown with a PAT that was no good. Myrtle Beach calibrated their first touchdown of the game and the score in the latter portion of the second quarter was Hartsville 22, Sea Hawks 7. 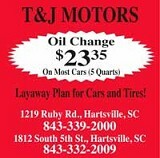 Hartsville came in with a long run by #4 Lacy Josey all the way to the Sea Hawks 6 yard line. The ball was ushered into the end zone giving the Foxes the lead with a score of 29 after the good PAT. With only two minutes left in the second quarter, Myrtle Beach turned possession over on downs. Hartsville had the ball on their own 41-yard line. Myrtle Beach had a score of 7, Hartsville had a score of 29. Then an amazing thing happened when #15 QB Tiyon Evans ran a rushing 62 yard touchdown with one minute on the clock. With a good PAT, Hartsville had a score of 36, Myrtle Beach 7. Myrtle Beach turned possession over on downs. Hartsville had the ball on their own 36-yard line. Hartsville punted to Myrtle Beach. Myrtle Beach had the ball on their own 37-yard line at the end of the second quarter. In the beginning of the third quarter Myrtle Beach kicked off to Hartsville and the kick was returned for a touchdown for the Red Foxes executed by #15 Tiyon Evans. The score was Foxes 42, Sea Hawks 7. Myrtle Beach turned possession over on downs. Hartsville had the ball on Myrtle Beach’s 25-yard line. 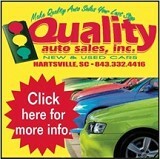 #1 JD Pendergrass contributed another pass completion and touchdown bringing the score to Hartsville 49, Myrtle Beach 7. The Sea Hawks didn’t give up and managed a touchdown from a Red Fox fumble giving the Sea Hawks a score of 13 points. With six minutes left in the third quarter, The Sea Hawks scored another touchdown. In the fourth and final quarter, #11 Justin Abraham brought the stadium to their feet with an earth-shattering tackle which gave the Foxes the momentum they needed. #3 Collins Bishop ran two rushing touchdowns to the Red Foxes advantage giving them a final score of 70, Sea Hawks 34. The Red Foxes were not only declared undefeated, but the region 6 4A champions of 2018. Congratulations to the Red Foxes for their determination and dedication. The Shoney’s offensive player of the week was #3 Collins Bishop and defensive player of the week #11 Justin Abraham. Congratulations for jobs well done!